FILE - South African Olympic and Paralympic sprinter Oscar Pistorius (C) is escorted to a police van after his sentencing at the North Gauteng High Court in Pretoria, Oct. 21, 2014. South Africa’s superstar athlete Oscar Pistorius got an early release from prison Monday night, bringing his time behind bars to just over a year. His family made clear that Pistorius is simply going from one prison to another — he’s required to spend the remainder of his five-year sentence under house arrest. "It is very important for the family to emphasize that Oscar's sentence has not been shortened or reduced,” family spokeswoman Anneliese Burgess told a media scrum gathered outside the Pistorius family mansion Tuesday. “He is simply entering the next phase of his sentence now. He will serve this under the strict conditions that govern correctional supervision," she said. Those conditions also include psychotherapy and community service. The icon-turned-inmate was due to be released Tuesday, having been granted parole after being convicted of culpable homicide — equivalent to the U.S. charge of manslaughter — for killing his girlfriend, model Reeva Steenkamp, at his Pretoria home on Valentine’s Day in 2013. But correctional officials, in an apparent attempt to sidestep the media frenzy that has trailed the runner since his shocking arrest and hotly followed trial, quietly released him from Pretoria’s Kgosi Mampuru II prison Monday night. The house of Oscar Pistorius's uncle stands in Pretoria, South Africa, October 20, 2015. Under cover of darkness, the athlete, who made history in 2012 as the first double amputee to participate in the Olympics, was driven to his uncle Arnold Pistorius’ large home in the wealthy Pretoria suburb of Waterkloof. South Africans raced to social media platforms to weigh in on Tuesday. Reactions ranged from indifference — “Plz we got more serious problems to worry about than this man” wrote user Mbekezeli Zulu‏ — to outrage. Steenkamp’s family has maintained that the sentence was too lenient. Pistorius claims he mistook Steenkamp for an intruder when he shot four times through a locked bathroom door, killing her. The prosecution argued — unsuccessfully — that Pistorius intended to kill Steenkamp. The couple were the only two eyewitnesses to the events of that night. 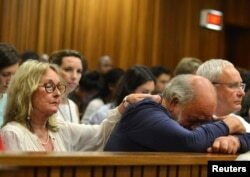 FILE - Barry Steenkamp, father of Reeva Steenkamp, is consoled by his wife June Steenkamp during the sentencing hearing of Olympic and Paralympic track star Oscar Pistorius at the North Gauteng High Court in Pretoria, Oct. 15, 2014. And as always in South Africa — a nation still struggling to heal from the scars left by its decades under the racist apartheid system — race was raised as a factor. 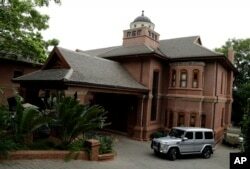 Some critics have argued that Pistorius was given preferential treatment because he is white and wealthy. “If Oscar Pistorius was black...different story” said Twitter user Twitter page the morning after. "The best bridge between despair and hope,” he wrote, “is a good night's sleep." But this release to the comforts of home, family and a familiar bed is hardly the finish line for Oscar Pistorius. He has been banned from competition for the duration ofhis five-year sentence. The prosecution is appealing the verdict on November 3.